There are movie sets so key to an iconic film that they loom large in our collective memory. Undoubtedly the tall and eerie house from Alfred Hitchcock's Psycho is one of them. I'd wager most of you could draw a recognizable sketch of it from memory. Well, the Psycho House--as its known--is entering its 55th year, but it's not holding up so well. 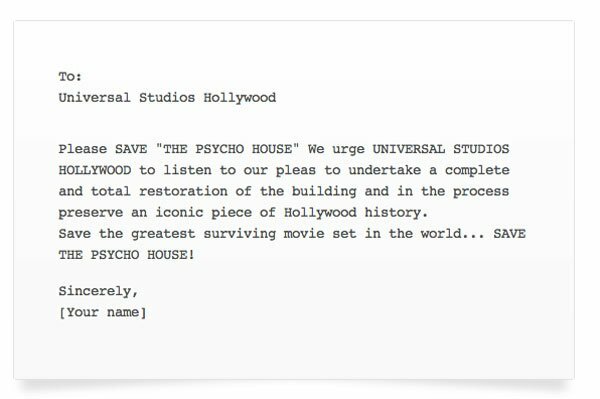 So, a petition composed by one of its avid appreciators has been posted on Change.org, entreating Universal Pictures to restore the home of Norman and Norma Bates to its former glory. Rather than some creepy location, The Psycho House was constructed in 1959 especially for Hitchcock's chilling adaptation of the Robert Bloch novel of the same name. It began as a two-sided façade, but over the years Universal built out a third, then fourth wall, and even added an actual roof so that the set could be used in a variety of productions--like the "Halloween Knight" episode of Knight Rider. In 1964, it was added to the Universal Studios Hollywood theme park tour, where it was a major draw and continues to be. That's little surprise as Psycho continues to have relevance with the help of the success of the prequel series Bates Motel.